The University of KwaZulu-Natal UK Trust is run by a Board of Trustees. Trustees are volunteers, normally drawn from alumni of the University resident in the UK. Appeals are made to such alumni to volunteer when a vacancy arises and prospective Trustees are vetted by the Board, who agree any appointment. All Trustees serve without remuneration or reward. The Trust, as a small, independent charity, does not employ any staff or rent any offices. 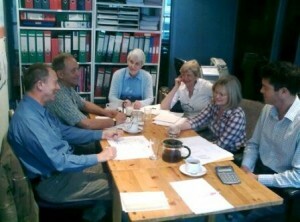 All the work is done by the Trustees and Trust supporters on a voluntary basis. If you are interested in helping the Trust by becoming a Trustee, please contact us. Roger was Political Reporter on The Daily News and subsequently News Editor on Business Day before emigrating to the UK in 1989. He worked at Westminster as Parliamentary Sub-editor for the Press Association in the 1990s and went on to manage editorial product development for Teletext until 2009. He is now Elections Editor for the Press Association. Trustee since 1992. After emigrating to the UK, Tess went on to obtain an MA in Literature and the Visual Arts from Reading University in 1987 and an Advanced Diploma in History of Art from Oxford University in 2005. Tess taught English in secondary schools and now teaches History of Art to adults. Trustee since 2004. Richard is not an alumnus but is a supporter of the Trust, who as Treasurer has kept the Trust’s finances sound, boosted revenue by securing the tax rebate on Gift Aid declarations and helped ensure compliance with Charity Commission rules. Richard worked for Midland Bank (now HSBC) for over 30 years before he retired, for the most part on the international side of the business dealing with the finance for imports and exports. But he did most jobs within branch, from sorting coin in pre-decimal days (before machines were invented) to making the tea. Trustee since 2004. After briefly teaching at Howick School, Penny came to England to further her studies and settled in SW London. She married a fellow South African and has a daughter and a son. She teaches Art and History of Art at St Paul’s School in Barnes. Trustee since 2009. After teaching English in Natal schools, Lorna toured Europe in 1958 before returning to her studies. She obtained an Academic Diploma in History of Art in 1963 from the Courtauld Institute, London University, and went on to become Curator of the Tatham Municipal Art Gallery in Pietermaritzburg. She married William Nimmo in 1964, they moved to Scotland in 1965 and had three children. Lorna obtained an Art Teacher certificate in Aberdeen in 1980 and taught art in Scotland until retiring to London. Trustee since 2009.